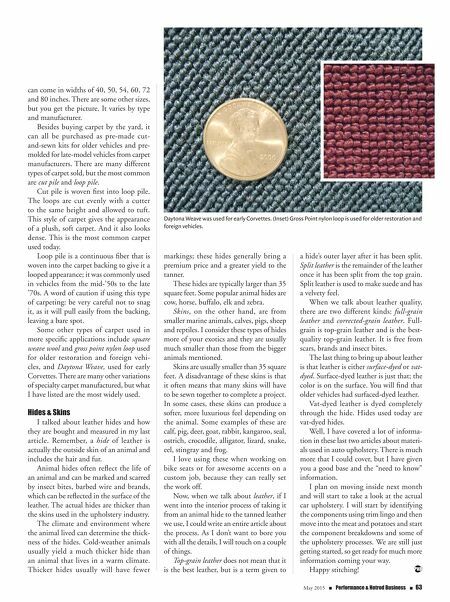 62 n Performance & Hotrod Business n May 2015 HOTROD A material that was popular during the early days of the automobile is mohair. Mohair material comes from Angora goats and is known for its durability. Mohair can be woven with different types of other fab- rics such as cotton, silk and wool. Mohair is velvety to the touch and can be rather pricey. You will find mohair used on vehi- cles from the 1920s, '30s and '40s, and is used mainly today in restoration projects. Broadcloth material was another option used during the same era as mohair and was even used into the early '50s. Broadcloth is a twilled, napped woolen material. It is a smooth and dense material that is rela- tively expensive. Broadcloth is typically made from cotton or wool and comes in either light or heavy weight. Bedford cord is also a wool-based mate- rial used during the same time period. Bedford cord is a heavy corded cloth, similar to corduroy material. These three materials are being manufactured today and are used mainly in auto upholstery restoration. I also don't want to forget to mention a few materials that are commonly not seen but are used in construction that are important to the auto upholstery industry. Denim, decking and muslin are all cloths made from cotton. Each of these fabrics is different in weight, with denim being the heaviest and muslin being the lightest. Denim and decking are commonly used for covering springs and reinforc- ing foam. Muslin is used many times for making lightweight dust-style covers. Each of these materials has many uses and is relatively inexpensive. Burlap can also be used for repairs and covering springs and is relatively strong. Carpet Carpet is another area that I need to discuss. This floor covering is typically made from synthetic or natural fibers. There are several different types of carpet. Carpet is not only used to cover the floor of a vehicle, but can be used on door panels, trunks and cargo areas, depending on the application for which it is needed. 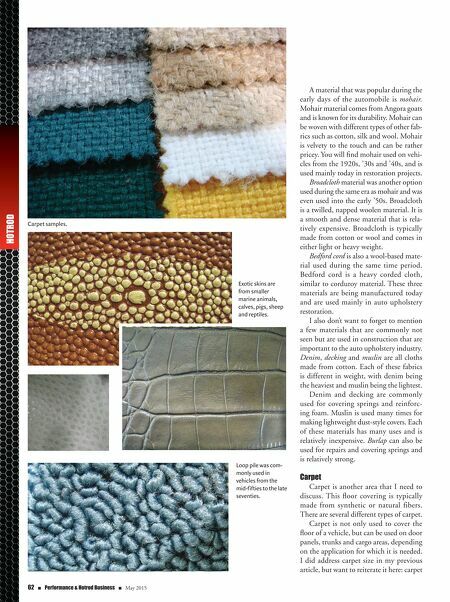 I did address carpet size in my previous article, but want to reiterate it here: carpet Carpet samples. Exotic skins are from smaller marine animals, calves, pigs, sheep and reptiles. Loop pile was com- monly used in vehicles from the mid-fifties to the late seventies.